Mexico and the United States may be neighbors, but their economies offer stark contrasts. In Mexico’s Uneven Development: The Geographical and Historical Context of Inequality, Oscar J. Martínez explores Mexico’s history to explain why Mexico remains less developed than the United States. Weaving in stories from his own experiences growing up along the U.S.-Mexico border, Martínez shows how the foundational factors of external relations, the natural environment, the structures of production and governance, natural resources, and population dynamics have all played roles in shaping the Mexican economy. This interesting and thought-provoking study clearly and convincingly explains the issues that affect Mexico's underdevelopment. It will prove invaluable to anyone studying Mexico’s past or interested in its future. "This book provides a lucid introduction to the history of economic development in Mexico by means of a comparison with the United States. It engages with debates in economic history about the roles and importance of geography and institutions in the paths to prosperity. 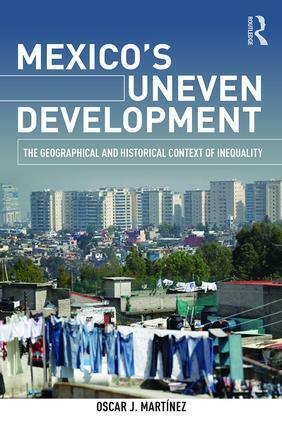 It also revisits dependency theory while putting the emphasis on national contexts." Oscar J. Martínez is a Regents' Professor of History at the University of Arizona. His previous books include Troublesome Border and Mexican-Origin People in the United States: A Topical History.